September 2014 - Page 3 of 5 - Pebbles, Inc.
It’s Mendi here today with an autumn wedding layout to share using more of Pebbles beautiful Home+made collection by Jennifer Hadfield! 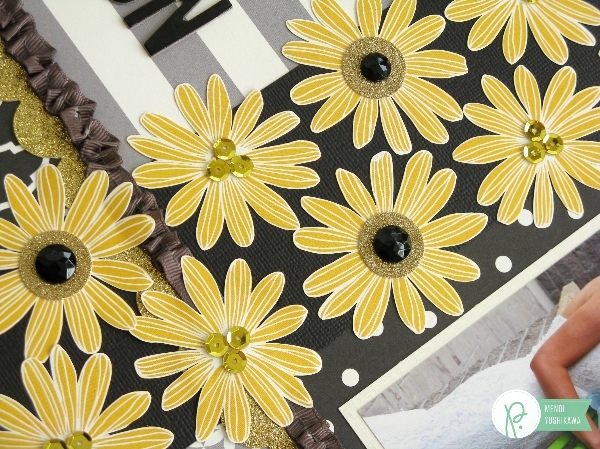 As soon as I saw this collection, I was instantly drawn to the gorgeous flowers from the Planters paper and thought they would be so much fun to cut out and use as a focal point on a layout! Fussy cutting them was the perfect activity to do while watching mindless TV and I enjoyed embellishing the centers with different sequins and jewels paired with the Gold Circle Glitter Stickers. For my phrase I was able to use the shrunken down version from the 6×6 paper pad and layer it over one of the chalkboard label stickers from the collection for a fun little element. 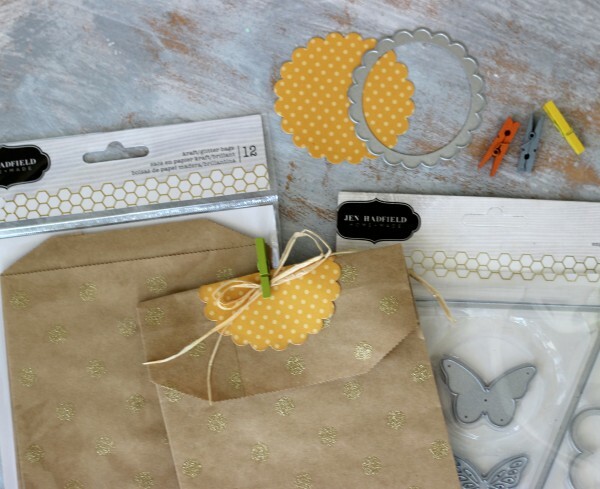 For another little detail, I layered the two butterfly dies from the banner die set with some decorative brads to repeat more of the yellow color. 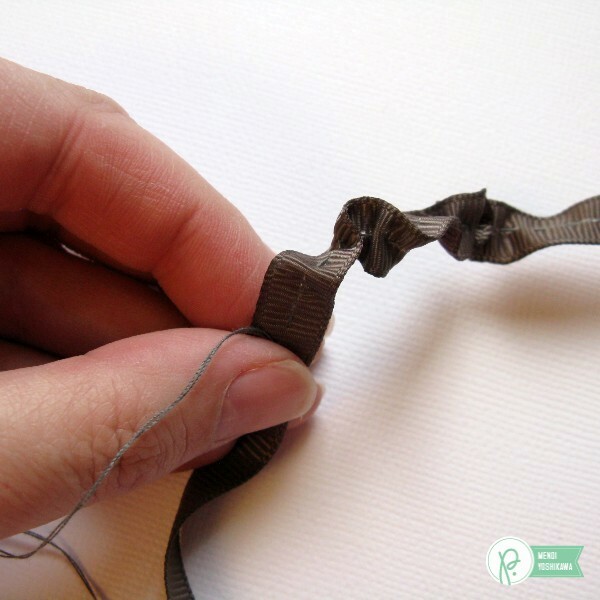 To create my gathered ribbon border, I simply took 24 inches of ribbon and gathered it using an old-fashioned running stitch with a needle and thread which I knotted on the end. When I had reached the end of my ribbon, I simply pulled the thread through to gather the ribbon without securing the other end yet. To adhere the gathered ribbon to my layout I used 12 inches of Scor-Tape applied to my layout and then set to work slowly pressing my ribbon into the sticky tape. The ribbon wanted to curl so I just took my time straightening it out and pulled it more flat where it would have my flowers overlapping. This gave me a little extra room to turn the two ends to the back side of my layout and tape them down. When I had everything where I wanted it, I finally knotted the other end of my thread. 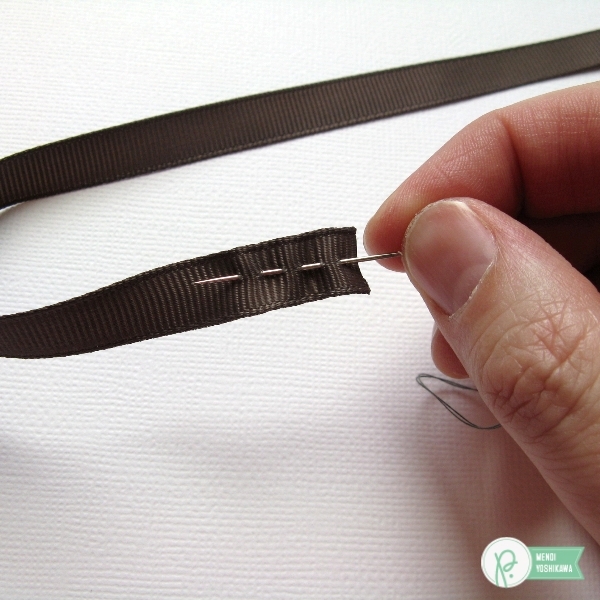 By waiting to do this step, I was able to pull my ribbon tighter or looser as I worked. 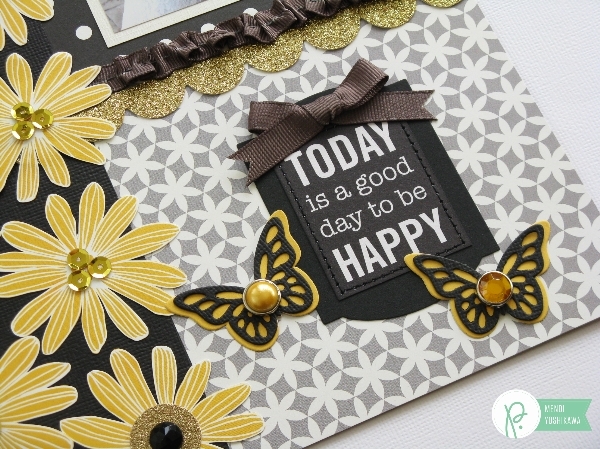 I love the texture the gathered ribbon gives my finished layout! 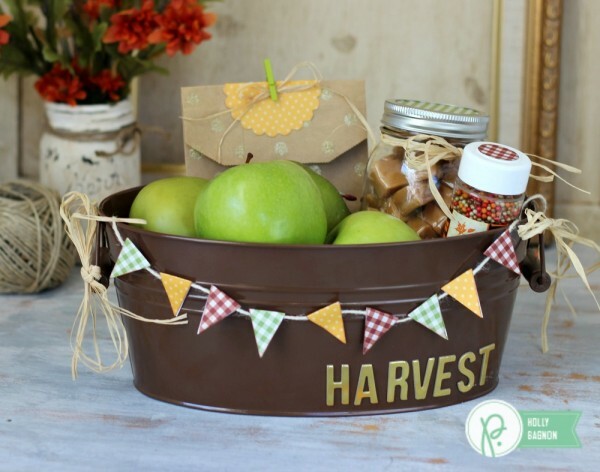 Holly here from Ribbons & Glue sharing with you a simple DIY Fall Harvest Basket. 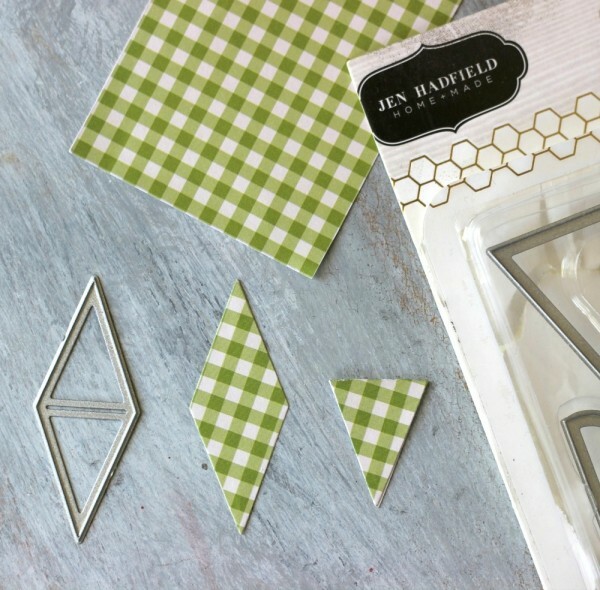 This sweet basket was inspired by the gold found in Jen Hadfield’s Home+Made collection and the warm patterned papers of the Pebbles Basics collection. Fall is upon us and fun caramel apples ides are popping up all over Pinterest. Yum! 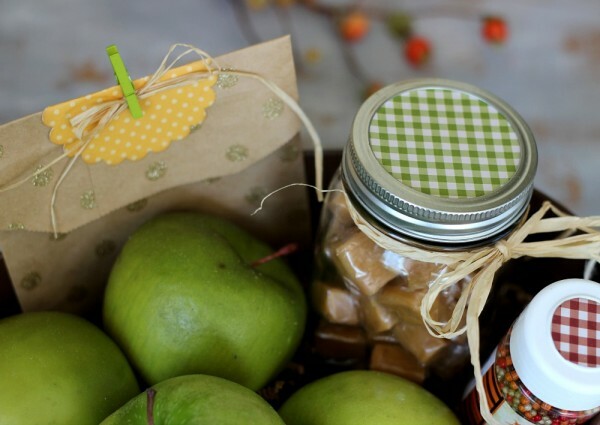 Even if you don’t care for actual caramel on your apples, you gotta love a mason jar filled with caramels. Right? The Harvest Basket is embellished with Gold Homemade Alpha Thickers and a mini banner made out of patterned paper in Pebbles Basics collection. It’s really easy to make a quick mini banner using the Homemade banner die set. 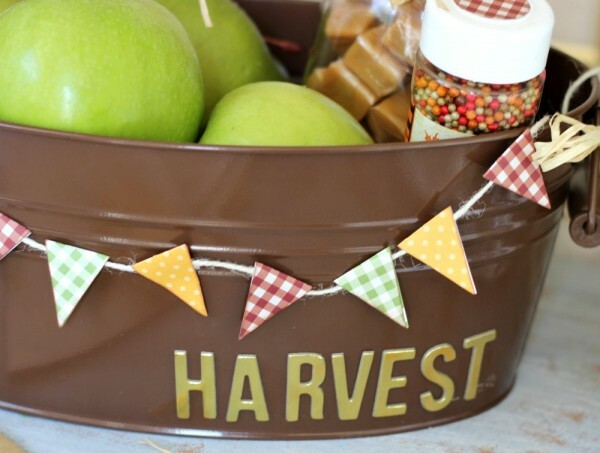 The Harvest Basket is full of all the goodies you would need to make caramels apples including Fall sprinkles. 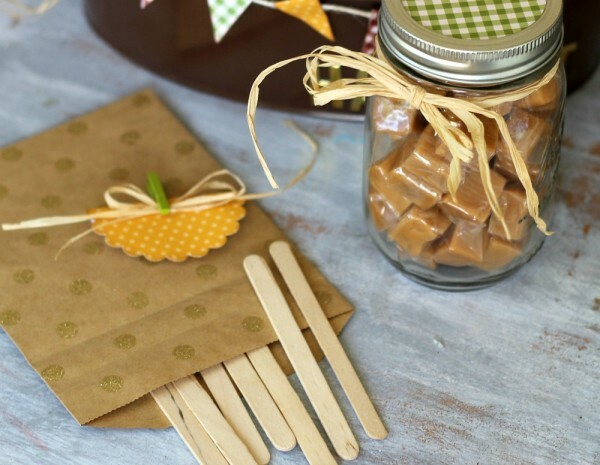 I placed the popsicle sticks needed to make caramel apples inside Pebbles Inc. Homemade Glitter Kraft Bags embellished with a scallop circle die and a Pebbles Basic clothespin. You can see how I assembled this caramel apple gift basket together on my blog Ribbons & Glue. Hi there, it’s Becki, I’m sharing a patriotic card set with you today. I used the Home+Made collection and my Silhouette to create a Patriotic card set that is perfect for sending to loved ones as a note to say that you care for them in their time of loss. 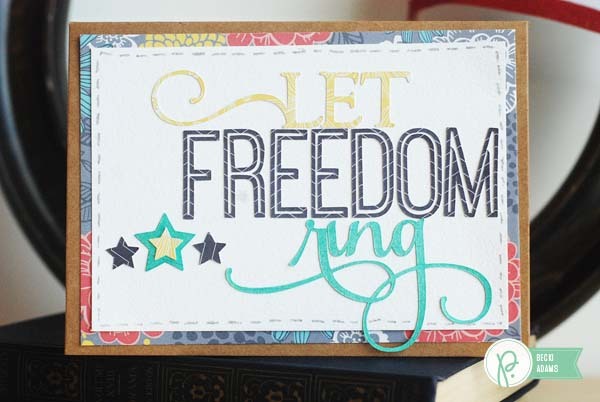 I used the spray mist to create this card by spraying the “ring” portion of the sentiment and the larger star. I wanted these pieces to have a little extra pop against the white background. 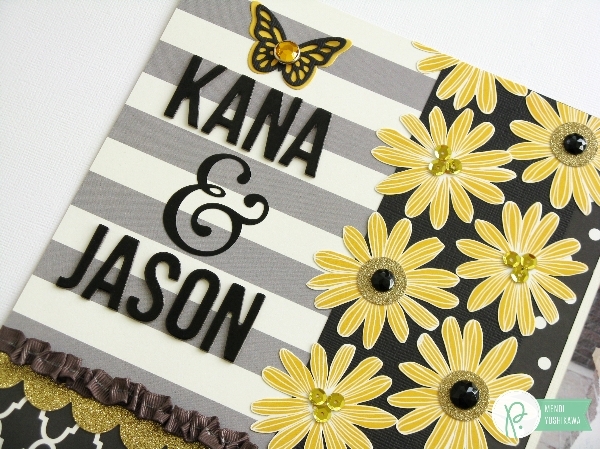 The little gold star is the perfect finishing touch to this card. 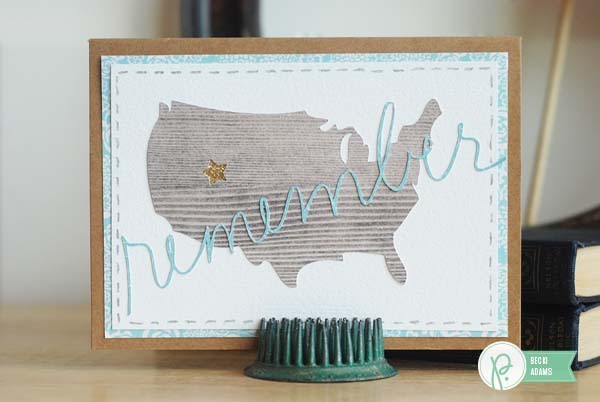 I simply put a piece of gold glitter tape on the white background before I added the die cut of the United States. On this Patriot’s Day, many of us will pause to remember our loved ones. Amanda here today with a timeless piece of decor to help you spark happy memories of your loved ones throughout the year. 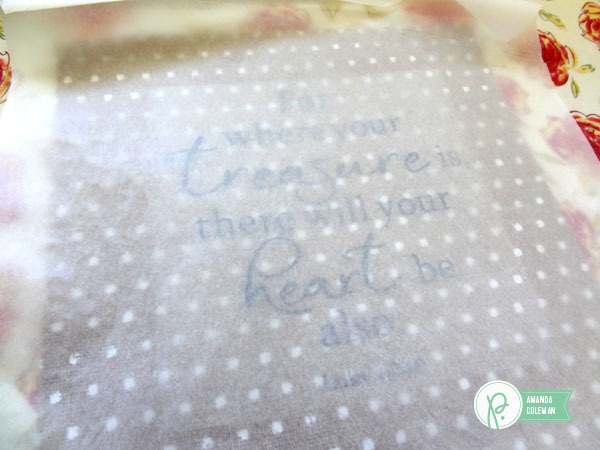 I die cut a quote from iron-on transfer and adhered it to the polka dot specialty burlap from the Home+Made collection. It was a bit of a beast to get the burlap into the hoop, but I finally figured out a way to do it and will show you below. 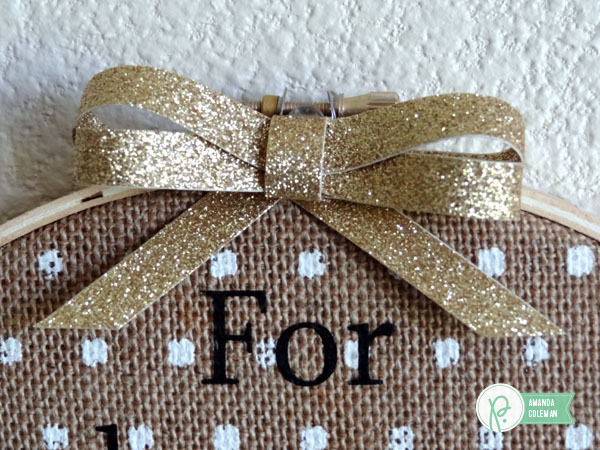 I didn’t have gold ribbon to make a bow, so I adhered two pieces of gold glitter tape together and folded it into a bow. I stapled the layers together in the middle and adhered strips to make the knot and tails. 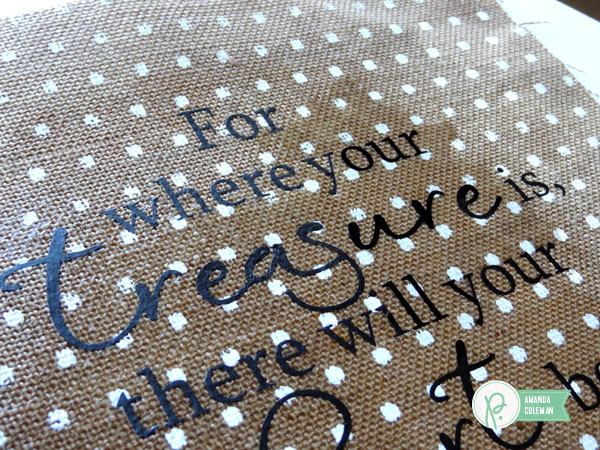 I die cut my quote from black iron-on transfer and ironed it directly to the top of the burlap. I used a piece of parchment paper to protect the burlap from the direct heat of the iron. 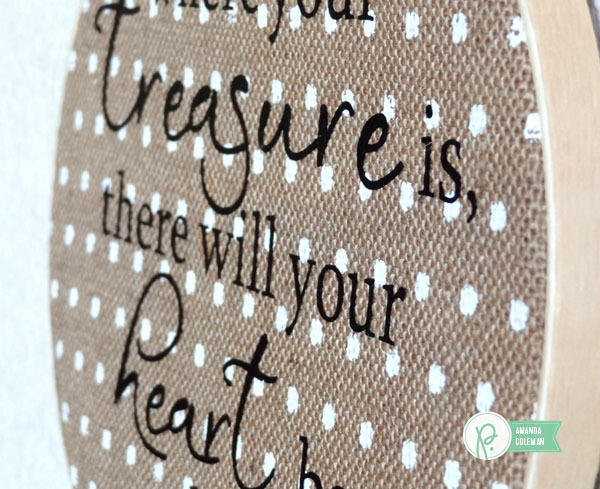 The polka dot burlap from the Home+Made collection is super stiff which is great for die cutting and other cutting applications, but I wanted this little baby to fold around an embroidery hoop. I tried several things to soften up the burlap, but the only thing that worked was getting it sopping wet. I laid the burlap on my kitchen table and poured water right on top, patting it to help the water go all the way through. I blotted it dry with a towel after it was nice and soaked. 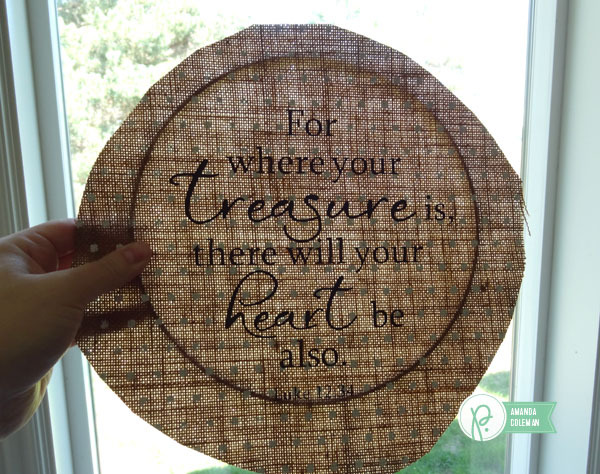 I trimmed the excess burlap from around the quote and and held it up against a window so I could center the quote in the hoop. 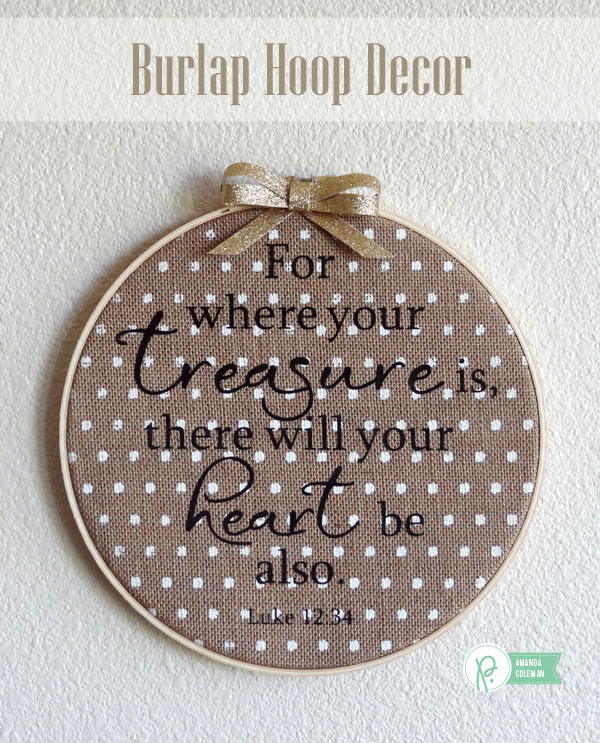 Looking at the hoop like a clock, I started by folding and clipping the burlap to the inner hoop at 12 and 6 o’clock. I then added clips at 3 and 9 o’clock. I added the remaining clips, folding and pinching the burlap as I went along. 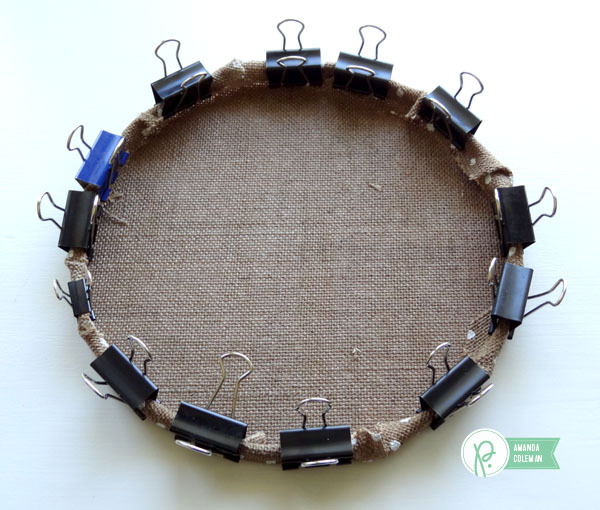 I let the burlap dry completely and then secured the outer hoop. I then trimmed the excess burlap from the back of the hoop. 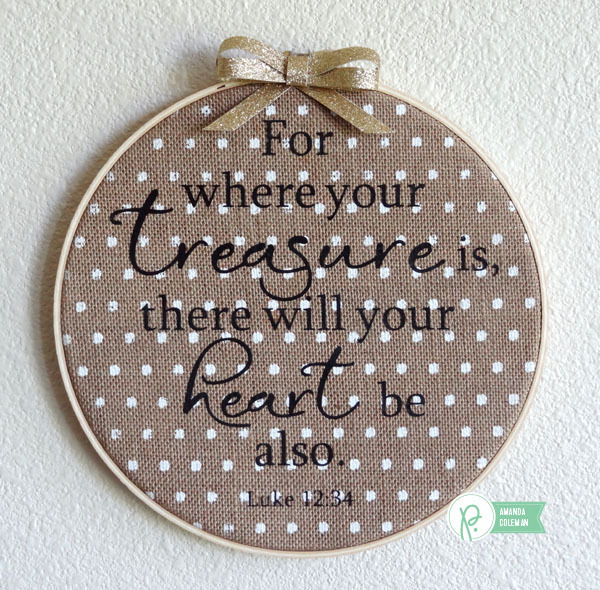 Today we are grateful to have guest designer Samantha Taylor join us on the blog. 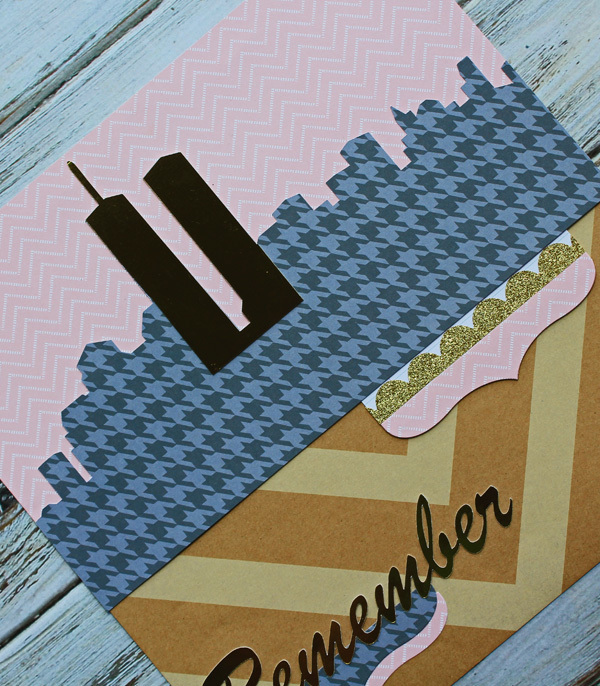 She is sharing a project that’s very close to her heart in memory of the tragic events that shook the world on September 11, 2001. 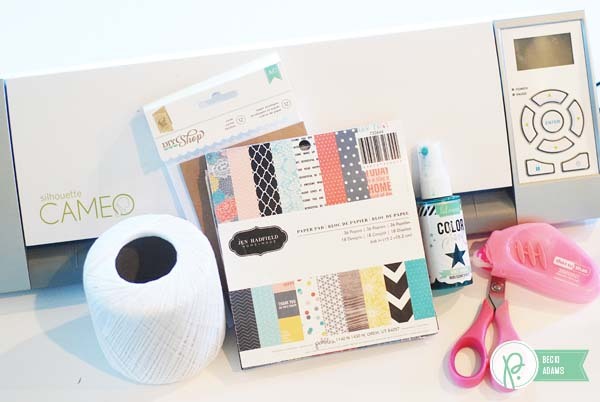 When people ask why I paper craft, or why I scrapbook, there are so many reasons. It’s fun, it’s a creative outlet for me, it’s a way to preserve memories. 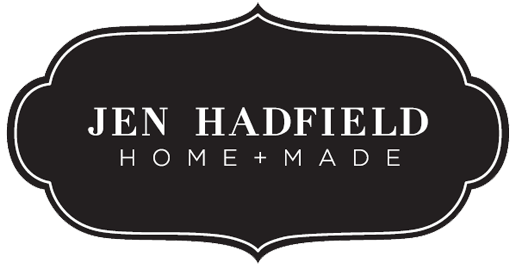 Today I’m sharing a project that is truly about preserving memories, even ones that are hard…especially the ones that are hard. Sometimes it’s hard for me to believe that this happened before my kids were born. I know some day my kids (and probably my grandkids) will ask me, “Where were you when?” I wanted to get my memories down on paper, and I wanted to do it in a way that would be reverent and respectful as well. I started by keeping this layout photo free. I cut the New York City skyline, and then made the towers out of gold foil paper. 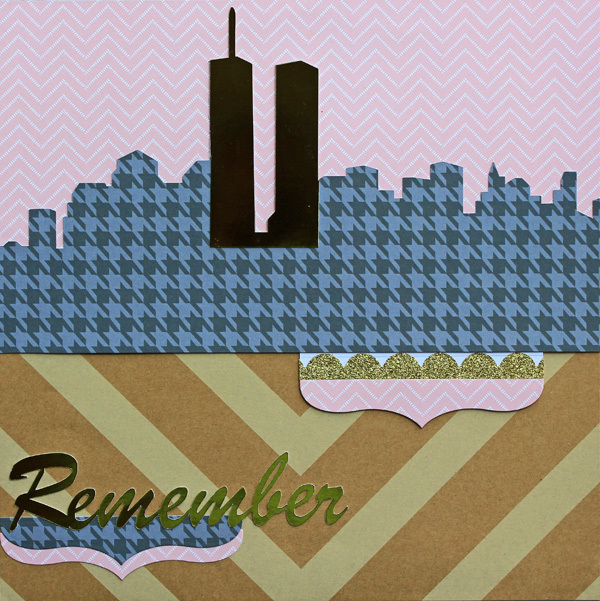 I didn’t get too fancy with the embellishments because I wanted the towers to be the focal point of this layout. While this layout is a way for me to record my memories, I didn’t want my journaling to be the center of this layout – I wanted it to be a piece of this layout. The best way for me to accomplish this was to make a little hidden pocket under the skyline, and slip my journaling in there. 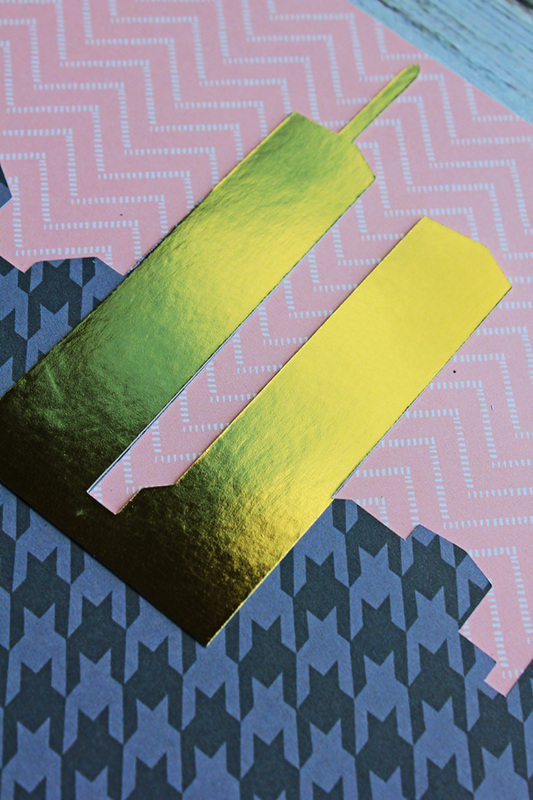 I did add a bit of gold glitter washi tape. There is something hopeful and beautiful to me about glitter, and it may sound silly, but we found light in the darkness that day, and I wanted a piece of that reflected in my layout. 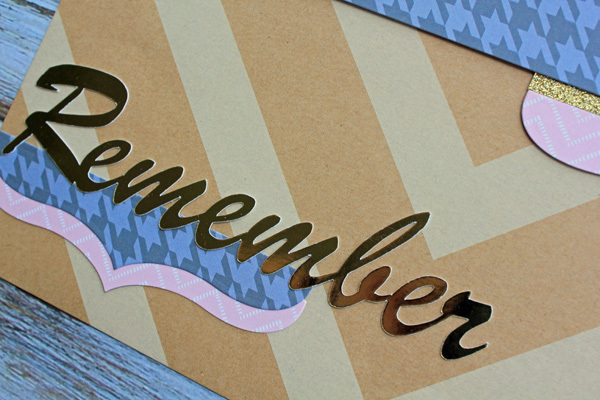 Finally, I used the same gold foil paper from Home+Made to create the Remember title for my layout. As a side note, I was a bit worried about how well the gold foil paper would cut with my Cameo. It cuts beautifully (almost better than regular paper) with a Cameo! 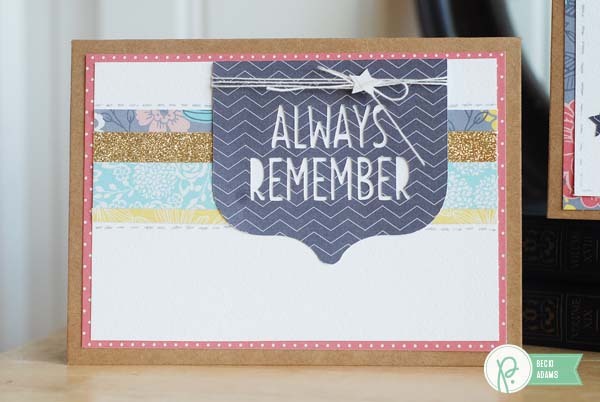 Thank you so much for letting me share my Remember layout with you today. This is truly a layout that is close to my heart.